A few weeks ago I wrote an article on this year’s International Rainbow Project. I was less than enamoured with it and said so. Shortly afterwards I was contacted by BrewChap, the brewing nom de plume of one Ian Cheeseright, graphic designer and home brewer. He said nice things to me about my honesty over what is one of the more pretentious of the yearly Craft beer events and told me that he had brewed a range of beers for his own Rainbow Project. But his were done in honour of the Children’s Television program, each of the beers being named after the characters, Zippy, Bungle, et al. It made me chuckle and warmed my cockles to know that there was someone else out there that found the whole Rainbow thing a bit strained and that had decided to satirise it in such a fun way. Ian agreed to send me some beer to try and when they arrived they were the best dressed home brew that I have ever seen. I decided that I needed to find out more from him. Hello there Ian, when did you start brewing, how and why? About four years ago, my wife bought me a home brew kit as a birthday present. It was one of those syrup in a can things and didn’t turn out particularly drinkable, but it got me wanting to make another one, but better. After a few more kits I moved on to extract brewing, which brought about a whole new world of possibilities and I was hooked. Not long after, I bought some equipment, moved to all-grain, cleared out the garage and started brewing in there at least once a month. I keep wondering whether my wife regrets buying me that first kit when she sees various fermenters filling up the spare room, or yeast starters taking up valuable space in the fridge. 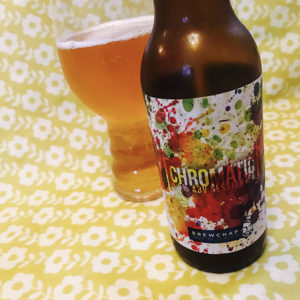 I like the name BrewChap and the logo and I’m interested in why you gave yourself a brewery name as it feels very similar to how I’d create cassette “labels” for releasing home made music. Likewise with dressing your beer up so beautifully with well designed labels. I started brewing around the same time as a mate of mine. We were discussing what we’d call our theoretical breweries over a pint in a pub in Nottingham and as I can be partial to occasionally donning tweed and a cravat when the occasion calls for it, the name BrewChap popped up and just seemed right. Regarding the labels, as a graphic designer it’s a good way of experimenting with different design styles. For me, bottle labels and pump clips are an art form. There’s so much a brewery can do with that little space on the bar or bottle and so many of them completely miss the mark. There’s no right or wrong when it comes to design, but so many breweries are erring on the side of caution and the end result is a bar full of very generic looking clips. Don’t get me wrong, some breweries are coming out with beautiful looking pump clips and now with the medium of cans to work with, I think some of them are starting to understand what good design can do to make their product stand out in a very saturated market. With the BrewChap labels, I just go with whatever seems to fit the beer. 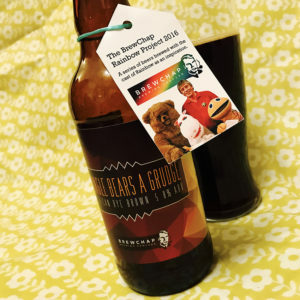 The Rainbow Project labels are a bit tongue-in-cheek, some beers continue with the “Chap” theme and some are just design experiments with the occasional musical reference thrown in for good measure. The design element does play a big part for me though. I wonder sometimes whether I continue to brew just so I can design more labels! You are brewing a wide range of different styles. What are your favourite styles and which do you think you do the best? There are so many styles out there and I’ve yet to find a style I dislike, so I suppose it’s just a case of pushing myself to try and brew as many different ones as I can. Each different style can bring new challenges, ingredients and ways of brewing which makes the hobby so interesting. As for favourite styles, I’m always partial to hop forward beers, but the bottom line is they has to be balanced. It’s so easy to just throw in loads of hops to cover mistakes, but this leads to very one dimensional beers. Recently I’ve been preferring a lower strength beer (particularly on a school night) and ignoring anything over 6% (I’ll leave those for the weekend), which is where the session IPA comes to the fore. I really don’t like the term “Session IPA”, but I do like the challenge of trying to brew something with the flavour of a 6 – 7% beer at a more sessionable 4 – 5%. I was happy with the way my session IPA “Chromatic” turned out, but I’d still like to improve on it when I come to brew the style again. Another of my favourites which I’ve brewed a few times over the years is the black IPA. I’ve still not tried any commercial examples of the style which have nailed it in my opinion. 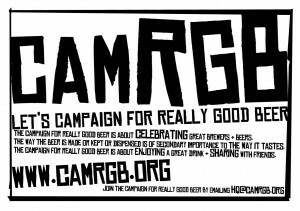 There have been some excellent examples, but there’s always been something lacking which, as a home brewer, is a good opportunity to try and go one better. I’ve got a black IPA on the go at the moment which I’m hoping goes some way to do just that! What plans do you have for your brewing or are you happy where you are? I see home brewing as an enjoyable hobby and have no real intentions to take it any further. I have friends in the brewing industry so I’ve seen how hard it is to keep small breweries going in the current climate. I enjoy my job as a graphic designer and look forward to brew days in the garage on the occasional weekend, so don’t really want to change that anytime soon. I’m just happy to try and continue improving my beers and if other people like what I’m doing, it’s a bonus! And so to the beer. Bungle Bears A Grudge (5.8%) is so nutty it’s, well, nutty. An American Rye Brown Ale, it has been brewed with lots of roasted rye and bags of Cascade hops. To be honest Brewchap told me that this was no longer at its freshest and the top end hit of sharp hops has started to wane, but that’s not a problem, because what this has becalmed is a round and comforting Brown Ale. It’s warm with toffee and brown bread, cappuccino, vanilla pods, pumpernickel and autumnal leaf litter. It’s crunchy and fat and chewy, gloppy honey and toasted bagels, a hint of peanut brittle and some roasted hazelnuts, and sitting with it on a dark October evening it feels just right. 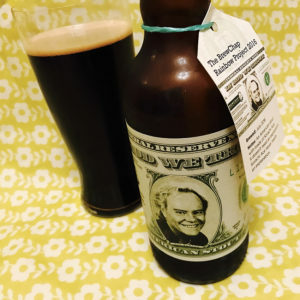 In Rod We Trust (6.5%) is an American Stout brewed with Sorachi Ace and yes it’s as good as it sounds. From its chocolate and window putty aroma to its deep purple brown colour, its coal tar and caramel malts to its bracken and green tea hops, this is a really superb beer to have been made at home. The Sorachi Ace gives you lemongrass and green tea, chives, basil and a hint of watercress, while the malts sit thick and oily on your tongue, rich with burned toast, molasses, Marmite and cola, it has a deliciously bloody metallic edge to the finish. If you’d paid a fiver for this in a hip craft beer shop you’d be over the moon. 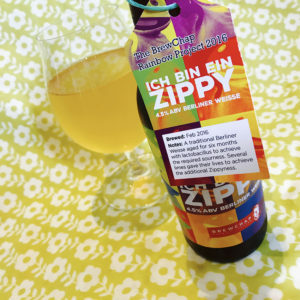 Ich Bin Ein Zippy (4.5%) is an extraordinary thing for a home brewed beer. Aged for six months with lactobacillus, this fresh and zingy Berliner Weisse has the added zap of fresh limes, nod boy does it work well. The beer pours a pale gold and smells of super fresh citrus fruit. Taking a swig you find a gentle pancake and caramel malt and a nice little salty tang before the limes go all zesty amongst the hedgerow of the hops. And all the while this is going on there’s a soft sourness swishing around in the background. 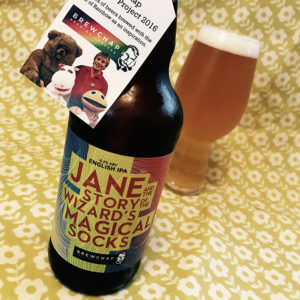 Jane And The Story Of The Wizard’s Magical Socks (6.2%) is an English Single Hop IPA using Jester, and it’s another super beer. It smells of of melon and peaches and a hint of honey and pours a rich hold with a fluffy little head. There’s a rich one malt body that’s full of cream crackers and toffee, brown sugar, shortcake and white pepper, and then there’s the hops. Jester is a hop I’m not massively familiar with, but based on this beer I’d like to drink it more often. It’s plump and fruity, lots of orange marmalade, lemon bonbons, peach and melon lead you towards a sharp fresh bitter finish. 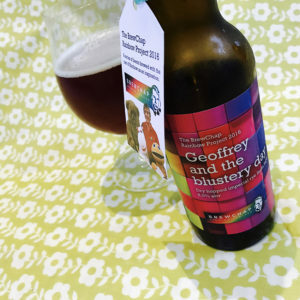 Geoffrey And The Blustery Day (8%) is a massive lagered beer. Describing itself as a, “Dry hopped imperial Rye India lager,” some of the top end of the hops have disappeared with age, but the beer has matured into a something very good indeed. The rye, oh the rye, it brings a spicy earthiness to the body of the beer and sits beautifully in the background giving you treacle tart, honey and brown bread, and over this the hops have gone all autumnal. They’re crunchy and pithy and brittle, some orange marmalade and a hint of lemon zest that prickles in the super smooth creamy finish. 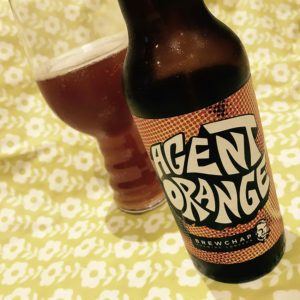 Agent Orange (8.5%) is a Mandarina Bavaria Imperial India Pale Ale and it sits a sexily deep orange in my glass. The aroma is orange marmalade and Toffo’s, inviting you to dive in and take a big chewy mouthful. And when you do you find those same Toffo’s and a great big dollop of the marmalade, along with lots of resinous pithy redwood, a good zesty grapefruit rind zing, sherbet lemons and a long bitter finish that’s underpinned by a rich brandy warmth. Steampunk (6%) is a California Common brewed in collaboration with Fawcett Brewery. Pouring a deep Amber with a nice fluffy head, the smell is strawberries and toffee. Taking a swig you find a great big chewy caramel and honey beer, rich with digestive biscuits and brown bread, it’s round and satisfying and there’s lots of woody walnuts and pecans in the background. The hopping is all orange marmalade, lime zest and herbal leaves that adds a good sherbet fizz to the bitter finish. Chromatic (4.5%) is a beautifully presented Session IPA and why not? Everyone else is doing them. And this one is much better than most offerings from professional breweries. Pouring a pale gold, the smell is fresh fruit salad with a fizzy sherbet twang. Taking a swig you find a super fresh hop hit, it’s packed with sherbet lemons and lime zest, mango, peach and grapefruit pith, garden flowers and green herbal leaves. And underneath this hoppy goodness there’s a very good caramel and pancake malt that provides a balance to the body that is lacking in a lot of Session IPAs. The finish to this little bottle of delight is zingy and bitter and crisp. This is very good brewing indeed. Thanks to Ian BrewChap for his time and his beer. 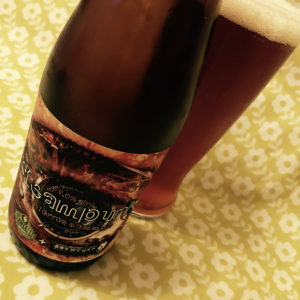 This entry was posted in Beer Review, Brewery, CAMRGB, Interview and tagged 7.5% +, Amber Ale, Beer, Beer Review, Best Bitter, Bitter, Bottle Conditioned, bottled beer, Brewery, Brewery Interview, Brown Ale, CAMRGB, Craft, Drinking, Home brew, Home Brewing, IPA, Pale Ale, Stout. Bookmark the permalink.